My kids love getting clean with the SoCoolKids line of natural soaps which we had the opportunity to review recently for Simply Stacie readers. 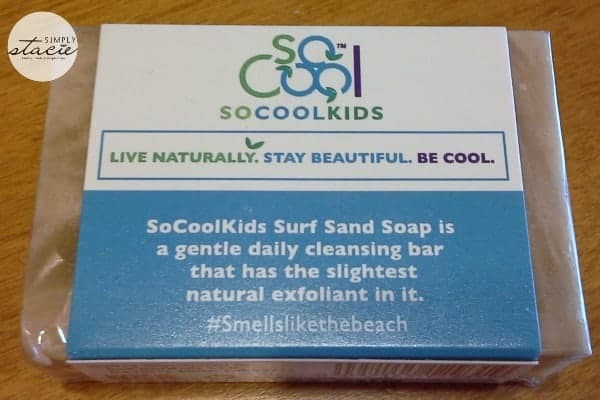 I particularly like using the products from this company because we live a more holistic lifestyle and SoCoolKids mission statement is for kids to “live naturally, stay beautiful, and be cool!” More importantly, the entire line is free of parabens, gluten-free, no synthetic dyes and no artificial fragrance. Since my daughter has severe, chronic asthma it is particularly important that we use products that work and are as naturally derived as possible. SoCoolKids does this brilliantly with line of soaps, shampoo and conditioner. Along with soaping up their bodies, my three children ages 6, 7 and 9 washing and conditioning their hair using the ActiveKids Daily Shampoo and ActiveKids Smoothing Conditioner. My children are all very active outdoors and this shampoo worked great to cleanse their hair while getting rid of dirt, sweat and grime. A quarter sized amount was enough to wash the entire head and this product is universally designed to be used by boys and girls. I appreciate that it is made in the U.S.A. with high quality natural ingredients such as plant and fruit extracts and oils. I also like that it is never tested on animals nor does it contain any animal products. A good conditioner is a must-have product for my daughter, Hannah as her fine hair tangles easily. In the spring/summer when my boys are swimming in the pool and at the beach, they also use a hair conditioner to keep their hair soft with less damage. The ActiveKids Smoothing Conditioner is a nice everyday conditioner. It is light-weight and I have not found it to build up on Hannah’s fine hair after using for two weeks (this has been a problem with other brands). To use, I have Hannah apply a quarter sized amount to the ends of her hair and then she massages on all the strands while using a wide-toothed comb to work it through and then rinses. When her hair air dries, we have noticed that it is smoother, softer and more manageable when using this conditioner from SoCoolKids. 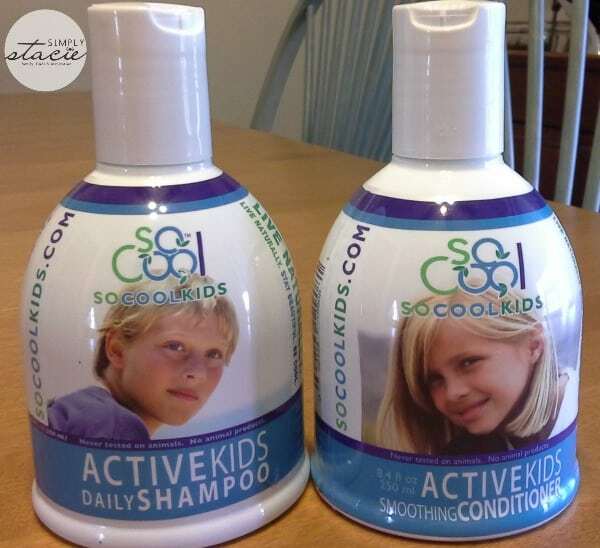 You are invited to visit SoCoolKids to learn more about the entire product line and select the bath products that would be best for your child. I highly recommend this company if you are searching for a naturally derived line just for kids that they are sure to think is really “cool”! Love the Surf Sand soap. It’s pretty! I love that this whole business was inspired by just looking at her son. They are now in New York and California. Congrats to them! I learned that the products inspiration was their son at the beach. i like the Surf Sand Soap sounds interesting. I like the Glycerine soap in the mango. I like that it is specially designed for kids. I like the Glycerine Soap in the different scents. I like the GLYCERINE SOAP DOUBLE BAR. I really love the Surf Sand Soap! The surf sand soap sounds pretty great! Their slogan, “Live Naturally. Stay Beautiful. Be Cool!” is cute. Besides soap, the website also have cute t-shirts for sale. I’d like the lemonade soap. I think the surf sand soap looks amazing!